WIW 1/22 & 2/6: Grey sweatshirt to the office x2! WIW 1/27, 29, 31: Four eyes cubed and KS typewriter bag! It's probably one of my most versatile coats, and is always a compliment magnet every time I wear it! Just goes to show the power of a statement piece that can elevate any basic outfit. Case in point: #3. Very basic casual outfit--T shirt, torn jeans and sneakers. Perfectly appropriate for MOTG kid-chasing, though maybe not the most exciting. But add the red corset trench (4-5) and pow--instant glamour! 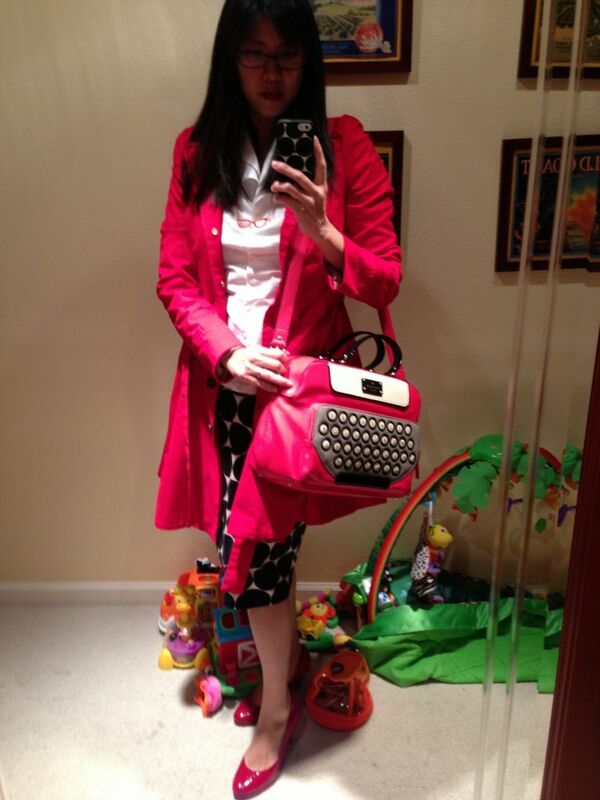 Most people would be happy to stop there (the red color and the corset back are plenty attention-getting), but my love of quirky ALGO compels me to add my usual matchy matchy, OTT details like the red spec necklace, typewriter purse, and polka dot bracelet and iPhone cover to match the typewriter keys (6-8). Maybe TMGO for some, but it's fun and so me! Perfect for swimming lessions and a day at the zoo with the family (including my sister and niece who are visiting). 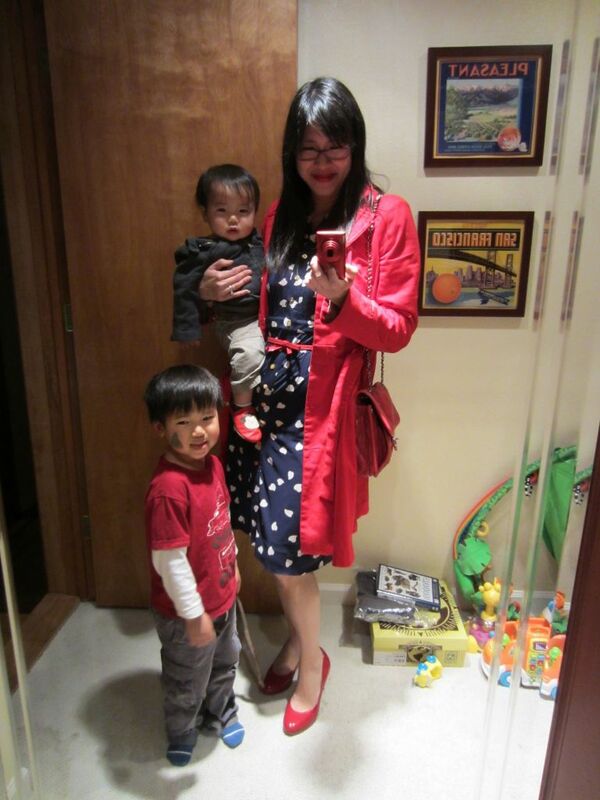 And then the trench transitions right into evening for a date night with DH--I had only 5-10 minutes after we got home to nurse DS2 and change into the floral dress and red pumps and then DH and I were off to dinner! And back just in time to put the kids to bed (14)! So there you have it, red corset trench twinnie, you know who you are...no shortage of styling options--take that lovely coat out for a long overdue spin and get ready for the compliments to roll in! And if anyone else has a statement piece hiding in their closet that you think is too fancy for MOTG or you have no occasion to wear it or whatever, I challenge you to de-orphan it, now! Ha, made you look! Nothing racy though, just some pics of me and the kids. I went to volunteer at DD's school for their Valentine's party--she read a cute book to the class called Penguins in Love, about two penguins who knit and fall in love. (She is learning how to knit this semester, so it was perfect). And then we played a game where the kids had to unravel the yarn to find their partner. 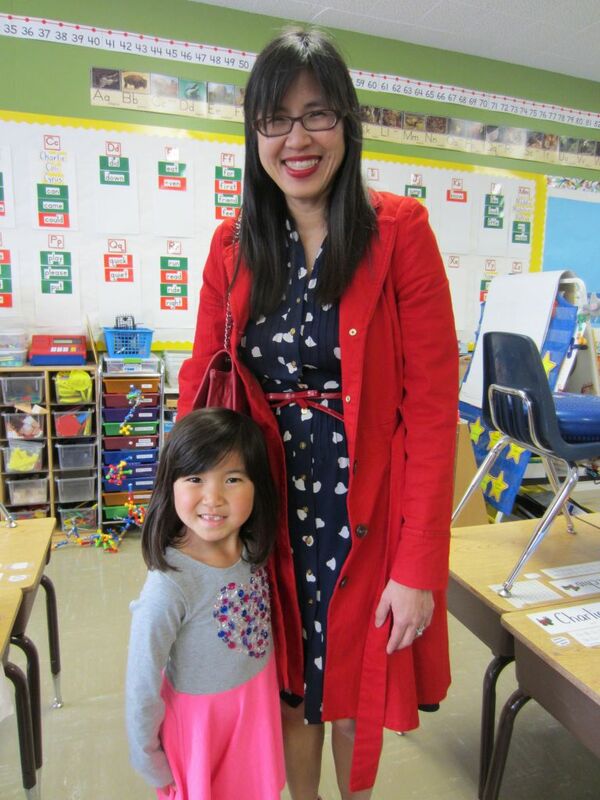 I got lots of compliments on the heart dress and the red corset trench. I love dressing in holiday themes! I couldn't get any solo outfit shots because once I got home, DS2 refused to let me put him down. And of course DS1 and DD wanted to join in the fun as well! Happy Valentine's Day everyone! Hey y'all!!!! You are SO going to get a kick out of this copycat. I found this blog Pinterest Told Me To after it was recommended on my mommy board. O.M.G.!!!! This lady Sheaffer is a RIOT. She is like a modern day Valley Girl. Totally AWESOME!!! Her plot reviews of the Bachelor (Hola, Huhwahan Pablo!) are like sneaking into a tub of chocolate coconut ice cream at midnight (BTW, these mocha almond dark chocolate dipped bars are to die for! Don't blame me. You're welcome.). I found myself LOL'ing, and I don't even watch this show! Can you say GUILTY PLEASURE??? And I couldn't help copying her and running right out to buy one of her entire MUST HAVE outfits. Yep, that's right. Ev. Ur. E. Thing. The whole enchilada. I'm such a total LEMMING. But it's not my fault! Sheaffer told me to! 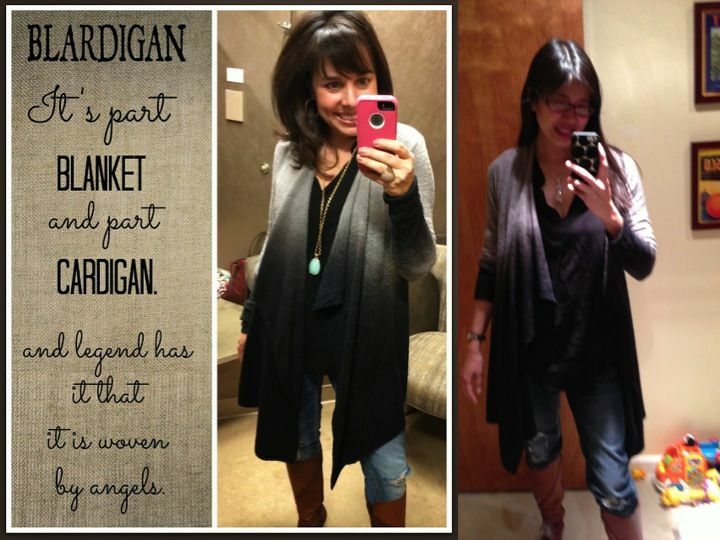 You can find the Barefoot Dreams chic lite wrap HERE. And the original Pinterest Told Me To post about the blardigan HERE. She names the blardigan a MUST HAVE HERE. I don't have the same pendant as she does, but THIS lucite Alexis Bittar pendant (#4) is a great substitute. So there you have it, y'all. Hope you enjoyed me channelling Sheaffer from PTMT. SUUUUPEERRR FUNNN!!!!! Now back to our regular programming! 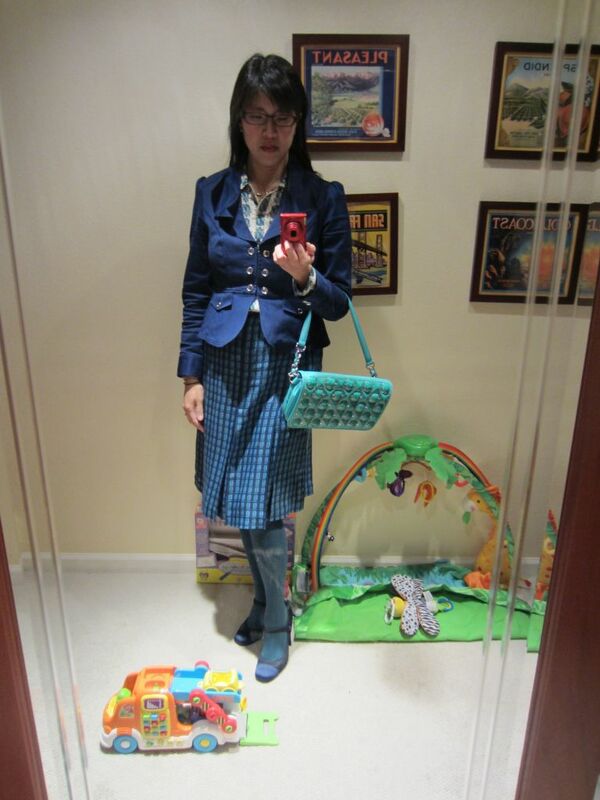 Another "edgier me" outfit--I wore this outfit to work, and repeated it (with my burgundy patent Aquatalia boots, forgot to get a pic) for date night. I am slightly embarrassed at how much I paid for a grey sweatshirt--I know I could buy a $20 one at Old Navy, but I wanted it to look polished if I was wearing it to work--hopefully this looks a little more luxe than your basic lounge sweats? 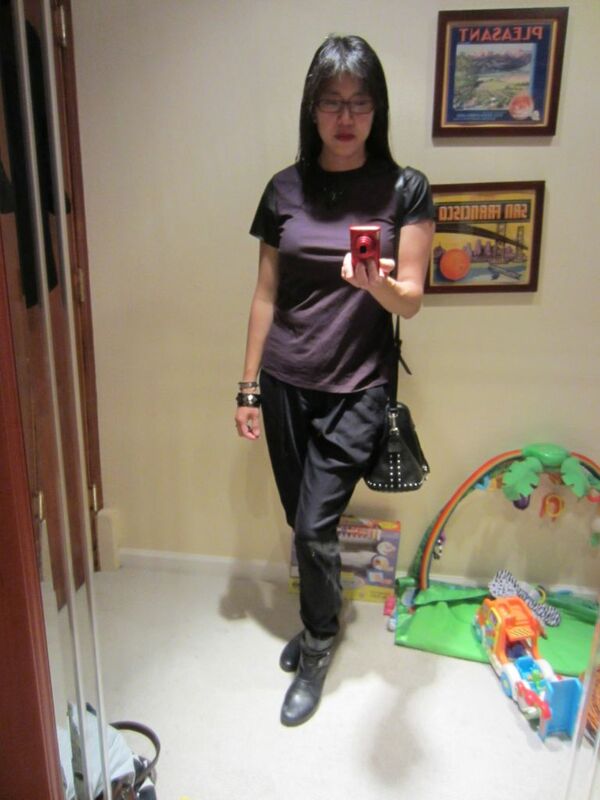 Initially I rejected wearing it with my slouchy trousers--I thought it would look too masculine. So I paired it with a black leather pencil skirt and the Okala pumps. Got lots of compliments on the outfit, especially the shoes! And nobody said, "Why are you wearing sweats to the office?" Or if they thought it, they kept it to themselves! After wearing my trousers several more times in the last few weeks, I decided to go for it and see if I could make the sweats + baggy trousers look work for my ladylike style. Threw on the big bubble necklace to femme it up. I felt a bit like a fashion blogger! I don't know if you can tell, but I'm having fun developing my alternate edgier style persona! Thanks for looking and commenting! I would never have thought to pair olive and pink, so it was fun to try a new color combination! The hot pink blouse and brocade sleeves on the jacket keep the outfit feminine and balance out the tomboy of the ripped jeans and stompy boots. 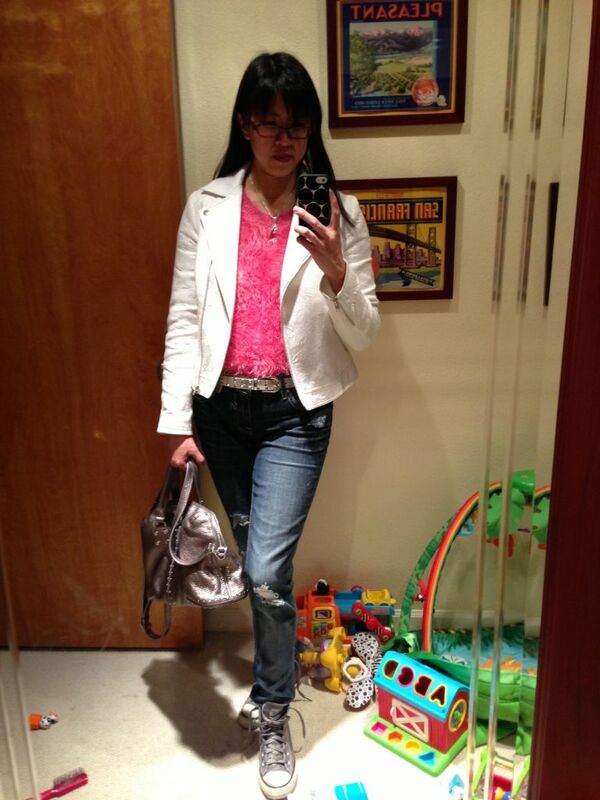 Fun casual outfit for a day off, dropping DS1 off at preschool and taming the baby-cat tornado. 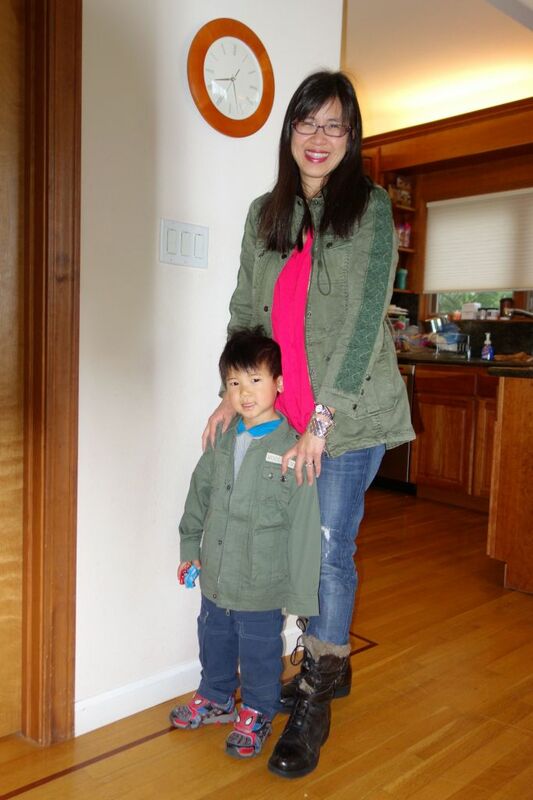 And even more fun to do the matchy matchy mini-me with DS1 instead of DD--we had matching army jackets! Still unapologetically loving my golden dragonfly 4 inch pumps! Ha! 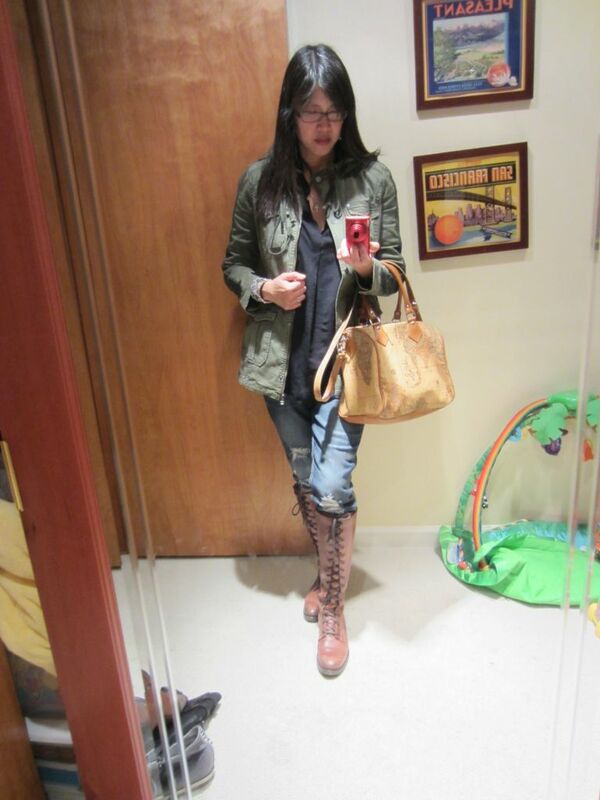 Bet you never thought you'd see me in an army green military jacket and ripped jeans, right? Princess Ladylike Polish takes on Warrior Tomboy RATE! I've got the rugged military jacket, combat-worn destroyed jeans, soldier boots, map satchel (I have to find my way through enemy lines to deliver the secret message), diamond "bullet" necklace, and spiked cuff weapon. Though I still had to have the girly details like the brocade ribbon on the sleeves, just so you know it's still me! DD was a girl warrior too, at a county chess tournament. She won two of her five games and had tons of energy all day. Very proud of her! but the first two sweaters I tried didn't work--one was too cropped and the other too baggy. So I ordered this one instead. Since I'm mostly going to be wearing it as a casual sweater with jeans, I thought I'd go for a longer sweater so that I didn't have to tug it down all the time or expose my belly. But I was a little self conscious that maybe I look like I'm wearing a bath mat, so I put a white jacket on top. 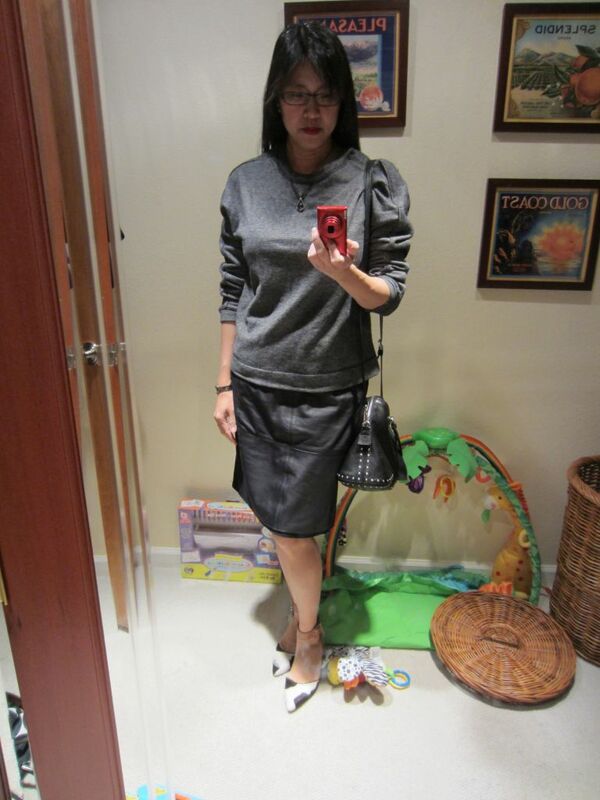 But then it looked funny with the sweater untucked, so I tucked it all in, and wore silver accessories (belt, bag, shoes). I wore it to take the kids swimming and to a birthday party at a bouncy house place, and then to visit their cousins for dinner. I know it doesn't look as sleek and stylish as Angie's outfit and the pics are making my gut look a bit tubby and my hips look huge. Sigh. DH had to work, but he laughed when he came home and saw me and said I reminded him of a Muppet. Yes, I know it looks a bit ridiculous, but it was only $24 so I can have fun with it a few times and not feel bad about ditching it when it goes out of style. Bonus, the kids love to pet and hug me when I'm wearing it! DS1 said I'm warm and cozy.